1. 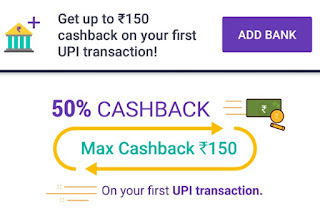 50% Cashback Offer is applicable only on making a successful transaction via your UPI-linked bank account. 2. 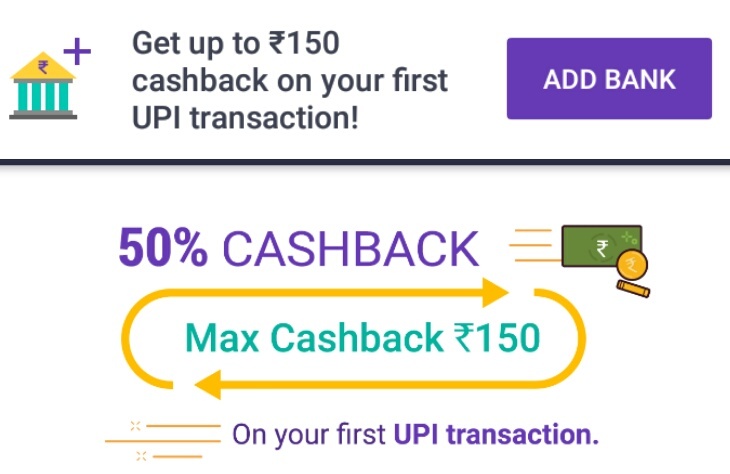 50% cashback on UPI transaction, maximum cashback of ₹150. 3. Offer is valid only for the 1st UPI transaction made during the offer window. 4. Offer is valid only once per User. 5. Offer is valid only once per Android smartphone. 6. Offer is valid for all successful recharges, bill-payments and money transfers. 7. Money transfers will be eligible only if money is sent to another Mobile number or @ybl VPA. 8. This offer is not valid for direct money transfer to bank accounts using the beneficiary’s bank account and IFSC code, or external (non @ybl) VPAs. 9. Cashback will be credited in your PhonePe wallet within 1 working day. 10. This offer is valid till 23:59 hours on 30th Jun 2017.